Each robot is equipped with a cable-winch system, and the system is able to exploit mechanical advantage singularities for appropriation of greater force. 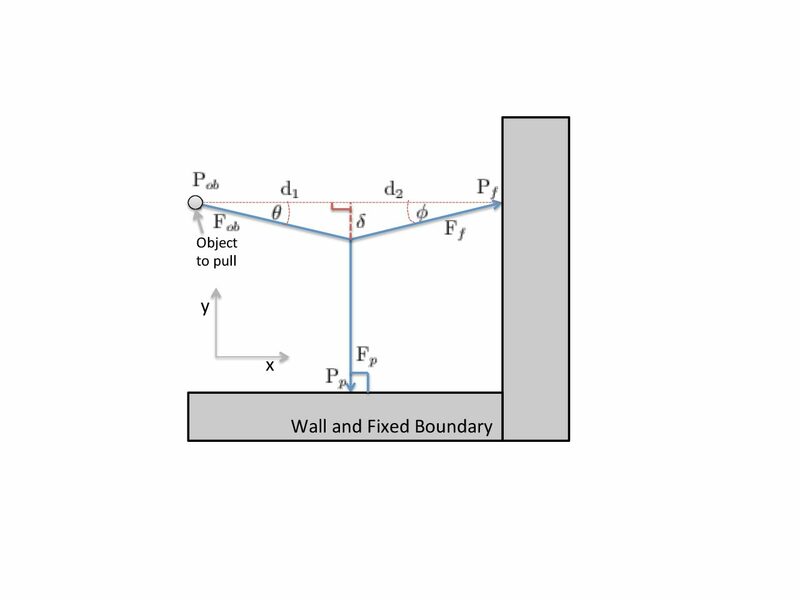 This is an ongoing project, though at present an examination of mechanical advantage in the workspace has been conducted, validating the ability of the system to benefit from singularities. The validation experiment used ckBot modules equipped with Kevlar cable winches for strength in pulling. The benefits of mechanical advantage were shown to be highly dependent on the material properties of the pulling cable (Kevlar, in this case), with mechanical advantage increases up to one order of magnitude. 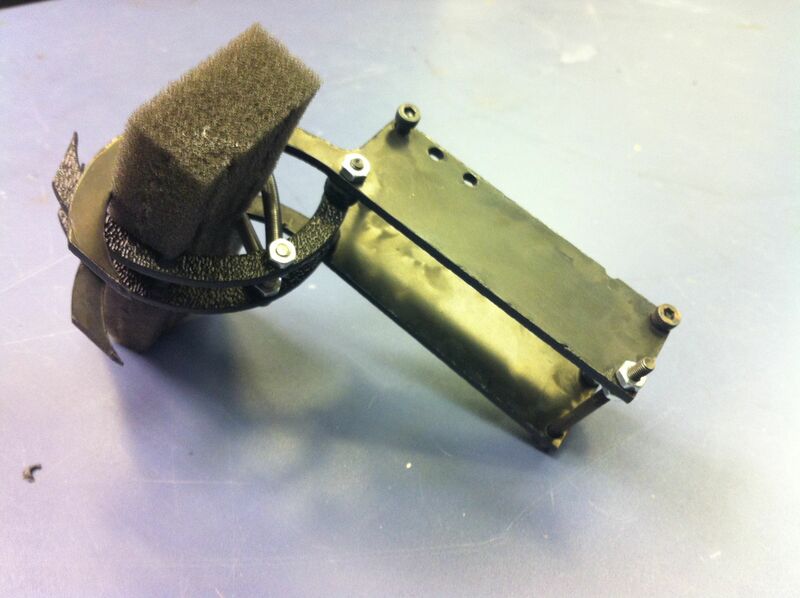 The concept for generating large forces was tested and modeled through the ckBot setup in a rigid aluminum frame, which acted as the fixed world boundary. The testing demonstrated the ability to generate favorable mechanical advantage, along with the ability to predict accurately the output force of the system based on the relative positions and attachment points of the robots. The image below depicts an abstracted geometric representation of the system. Along with producing forces to move heavy objects, the system must also grasp onto a wide variety of unstructured fixed objects in its workspace. 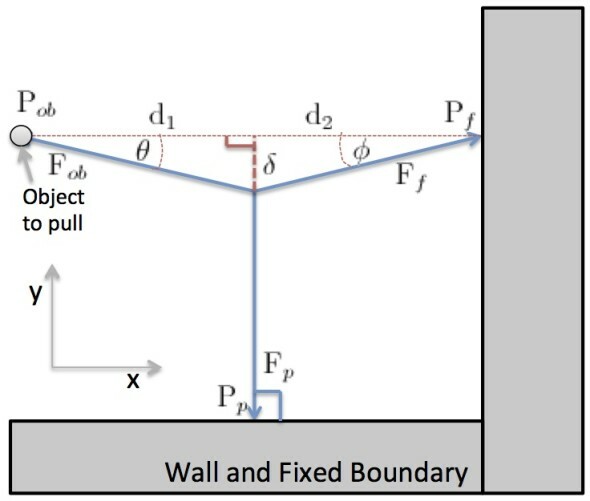 This can be accomplished using a number of gripper designs, though a fixed-hook gripper works best for transmitting force while minimizing deflection and failure potential. Dec 16, 2013 | Filed under Cable Robots, Uncategorized and tagged with jongreco.